Cleveland’s Czech community is one of the area’s oldest European ethnic groups, with a presence in the area even before the Civil War. It is almost a geographical accident that Czechs arrived in Cleveland, where they would have stopped on the way to Czech or Bohemian communities in Nebraska, Iowa, and Wisconsin. 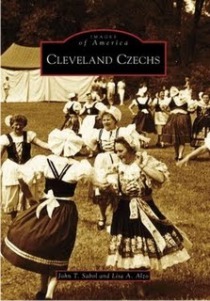 From 1850 to 1870, the Czech community grew from 3 families to 696, according to The Encyclopedia of Cleveland History. Many found work making barrels for John D. Rockefeller’s fledgling Standard Oil Company, while others found their way in professional life, including the arts. Their neighborhoods show their migration from Cleveland’s central city to its outlying areas and suburbs including neighboring Geauga County. Today they continue to support three Czech halls and participate in the Czech gymnastic movement-Sokol. The photographs in Cleveland Czechs give readers a glimpse of those neighborhoods and their importance to Cleveland’s history.